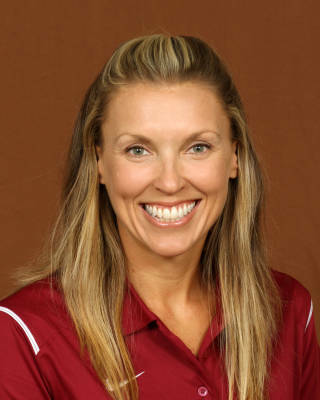 Florida State University athletics announced the hiring of U.S. beach volleyball professional Brooke Niles as the Seminoles beach volleyball head coach on June 16, 2015. Niles, a California native who earned All-America honors as a player, has coached at the collegiate, junior college, club and high school levels working with both indoor and sand volleyball teams. In 2016, Niles led the Seminoles to unprecedented heights during the program’s first season as an official NCAA Championship sport. Her first year in Tallahassee was highlighted by a series of program firsts including a school-record for dual-match victories (32), a conference championship, the top-seed in the inaugural NCAA Beach Volleyball Championship and a national runner-up finish. Florida State hit the ground running under Niles, winning its first 14 matches, all on the road, with eight of those victories coming against ranked foes including five ranked in the top-10. One of those wins came against then-No. 2 Southern California in Los Angeles as the Seminoles snapped the Women of Troy’s 19-match home win streak. FSU went on to earn the No. 1 overall seed at the NCAA Beach Volleyball Championship after claiming the 2016 Coastal Collegiate Sports Association (CCSA) Conference title. The Seminoles finished the 2016 campaign as the national runner-up at the NCAA Beach Volleyball Championship in Gulf Shores, Ala. after posting a 3-2 record at the tournament. FSU went on to set the single-season school record for victories in a season with 32 and ranked in the Top 5 of the AVCA national poll all year. Along with their 14-match win streak, the Seminoles also put together a school-record 17-match win streak which saw Florida State outscore the opposition 71-10. At season’s end, Florida State registered 19 victories over ranked schools, while posting an 11-3 mark against teams ranked in the Top 10. In her second year under the helm Niles continued the winning tradition of Florida State beach volleyball. The team finished with the second most wins in school history and the third most in the country (29). Niles and the Noles secured back-to-back CCSA Championships after they defeated FIU 3-0 in 34 minutes. Florida State reached their second consecutive NCAA Beach Volleyball Championship appearance and sixth straight post season appearance, tied for most of any school. The Seminoles finished the 2017 season in fourth place at the NCAA Beach Volleyball Championship in Gulf Shore, Ala. after going 2-2 at the tournament. The Noles defeated a school record 22 ranked teams during the 2017 season including 13 wins over top-10 teams and three over top-5 teams. The 2017 season saw the Garnet and Gold defeat Pepperdine for the first time in school history as they took down the second-ranked wave in Tallahassee. Under Niles, Florida State garnered two AVCA All-Americans, six CCSA All-Conference selections, a league-best three student-athletes named to the CCSA All-Academic team in 2016, the CCSA Scholar Athlete of the Year (Macy Jerger) in 2017, the CCSA Pair of the Year in 2016 (Julie Brown/Jace Pardon) and 10 Seminoles who earned a spot on the CCSA Academic Honor Roll. Niles was recognized for her outstanding effort in her first season at the helm of the Seminole beach volleyball program as she was named National Coach of the Year by the American Volleyball Coaches Association (AVCA). Niles, who earned a law and society degree from UC Santa Barbara in 2003, was a third-team All-American while playing for the Gauchos where she also was a three-time All-Big West selection and named conference freshman of the year. Following her playing career at UCSB, Niles spent three years as an assistant indoor coach at her alma mater before beginning a successful professional beach volleyball career in 2007 that saw her win numerous pro tournaments along with being named the AVP Beach Defensive Player of the Year in 2009. While climbing to a Top 5 ranking in the National Volleyball Beach League and spending 2010-13 as a member of the USA Beach National Team, Niles was a first alternate for the USA 2012 London Olympic Beach National team. The Woodland Hills native returned to coaching in 2010 at Oxnard Junior College with the indoor team. In 2012 she began coaching professional beach volleyball teams competing on the FIVB World Tour from the USA, Costa Rica and the Netherlands. Most recently Niles coached at Mira Costa High School in California and she was the director, founder and head coach of The Beach Team Club in Hermosa. Niles is married to Nick Lucena, a Florida State graduate, professional beach volleyball player on the AVP Tour and Olympian in the 2016 Olympics in Rio. They have one child, Gunnar.